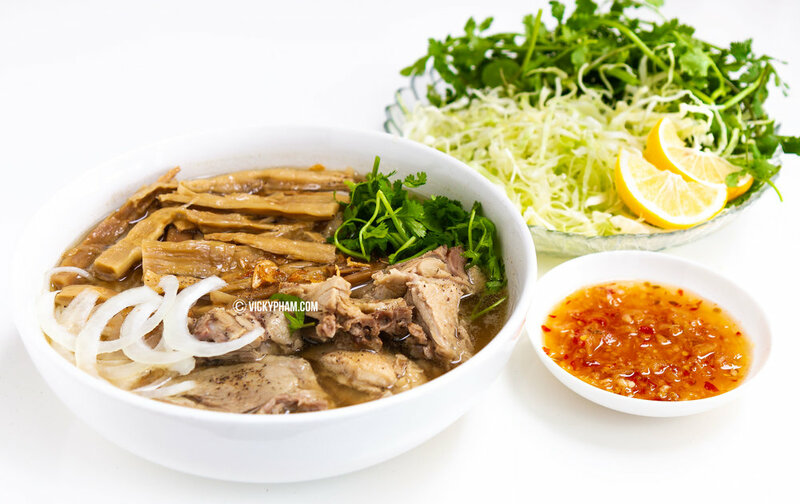 Bun Mang Vit is a Vietnamese rice vermicelli duck noodle soup with bamboo shoots, garnished with shredded cabbage, thin slices of yellow onions, green onions and a wedge of lemon for squeezing. Other herbs like mint, cilantro, Vietnamese coriander (Rau Ram) and green onions may also garnish the bowl. 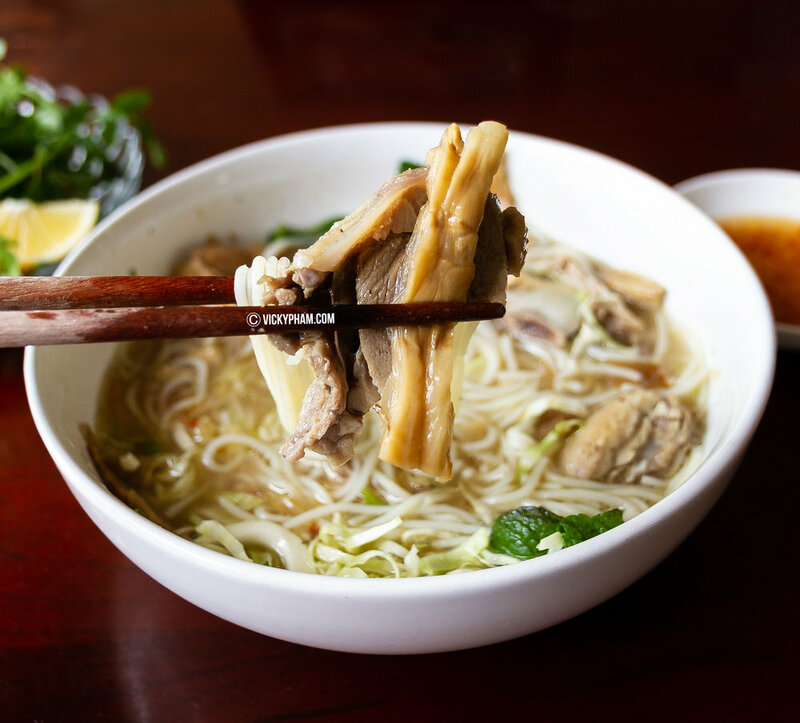 This noodle soup comes with the must-have ginger fish sauce (Nuoc Mam Gung) on the side for dipping the slices of duck meat. Alternatively, you can use chicken instead of duck (Bun Mang Ga). It’s rare to find Bun Mang Vit at Vietnamese restaurants here in the States so follow the recipe below for a taste of this underrated noodle dish from Vietnam or befriend a Vietnamese grandma. Whenever I make Bun Mang Vit, I always use dried bamboo shoot. There is a lot of preparation when using dried bamboo that starts the night before but dried bamboo provides a deep earthy flavor and crunchy texture that’s just not present when using other forms of bamboo (fresh, canned or the ones that’s already boiled and prepackaged in the refrigerated section of Asian supermarkets). The dried bamboo needs to be re-hydrated and boiled for at least 2-3 times with changes of water each time to remove its overpowering smell. After several boilings, the bamboo will increase in volume and softness. I really love the flavor and textural contrast in this noodle soup. The shredded cabbage provide a crunchy contrast to the soft rice noodles. The sharp zingy flavor of the ginger fish sauce, the key element that pulls everything together, nicely cuts through the fatty duck. Soak dried bamboo in water overnight to soften. Wash bamboo few times and squeeze out excess water until water runs clear. In a large stock pot, bring water to a boil then add bamboo. Boil for 15 minutes then drain into a colander placed in the sink to discard water. Repeat the boiling until water is clear and no longer yellow. For this particular batch of dried bamboo, I had to do a total of three boilings to get rid of all that yellow water. Drain bamboo and give it a final wash/rinse then drain dry. Cut off any hard stubs and shred (follow the grain) into thin bite-size strips. In a small skillet, add vegetable oil and heat on medium high. Add shallots and saute until fragrant. Add garlic next and saute until fragrant. Add shredded bamboo. Pan-fry and evenly toss in aromatics. Season bamboo with chicken stock powder, sea salt and sugar. Set aside. Clean the duck by rubbing ginger, salt and vinegar all over the skin and insides of the duck. Use the abrasive action of the salt to scrub and remove the foul poultry smell. Rinse duck and drain dry. In a large stock pot, bring 3 liters water to a boil. Add duck, yellow onions and sliced ginger. Simmer on medium low and occasionally skim off any foam that rise to the top. After 20-25 minutes, transfer cooked duck to an iced bath. Remove whole onions and ginger and discard. Add sauteed bamboo to the stock pot and simmer on medium low for one hour. Season stock pot with rock sugar, sea salt and stock powder. Once duck is cooled, chop duck into bite-size pieces with a large mallet. Set aside. Cook noodles per package instructions and prepare the garnishes/vegetables. To make the Ginger Fish Sauce Dipping Sauce, mix together fish and sugar until fully dissolved. Pound the ginger and garlic cloves with a mortar and pestle until completely pulverized then add to the fish sauce/sugar mixture. Add lime juice and chili peppers. To assemble, add vermicelli noodles to the bottom of a bowl. 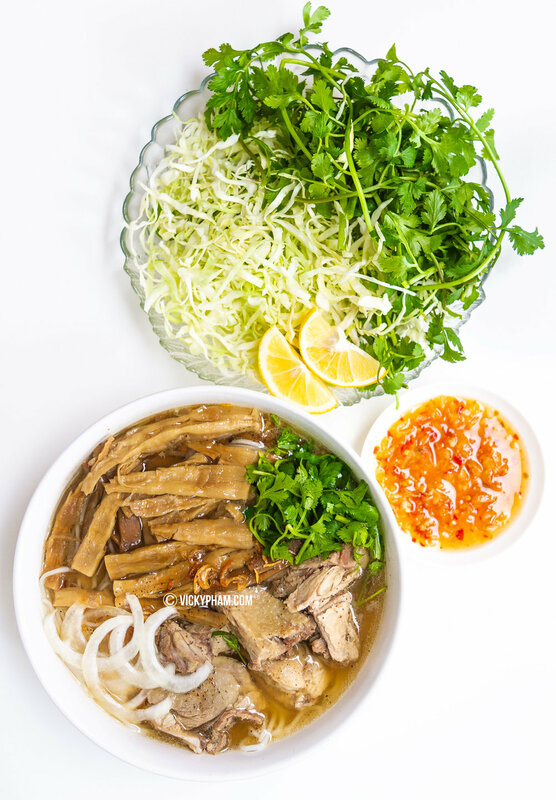 Add a few slices/chunk of duck, laddle in hot broth with bamboo shoots, and garnish bowl with sliced yellow onion, green onions, cilantro, cabbage, mint and coriander. Top bowl with fried shallots and a lemon wedge for squeezing. Serve bowl of duck noodle soup with a side of ginger fish sauce for dipping duck meat.